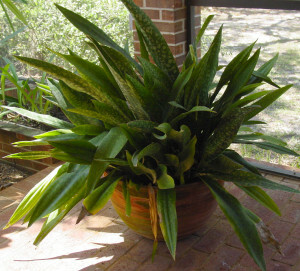 Snake plant, mother in law's tongue and the good luck plant are other common name for sansevieria. There are many species and cultivars of sansevieria. Some can reach heights of 5 feet and more, others are ground hugging rosette types. The leaves, which can be strap shaped or tubular, all have some kind of mottling or vertical stripes in the variegated varieties such as sansevieria trifasciata. The most commonly grown and easily recognized sansevierias have sturdy and erect strap like leaves from 2 to 5 inches wide and growing up to 5 feet tall. All have distinct grayish mottling or blotches against a dark green background and some also have a yellow or red stripe along the edges. Most all sansevierias are tough customers and practically thrive on neglect. Even if you have a black thumb, you should be able to easily grow these indestructible plants. Under ideal conditions, sansevieria will reward you with with a sweetly scented bloom spike during the warmer months of the year. The tall stalk is produced from the base of the plant and looks very much like an asparagus tip when it first emerges. The bloom consists of dozens of individual tubular flowers which are a greenish white and measure up to 3 inches long. Sansevierias have a very dense root system. The one pictured here actually managed to break a heavy 20" clay pot. Just popped pieces out of the pot as if it were made of paper. We now moved it into this 30" clay container - the biggest one we could find that would not give you a hernia moving it around. If you live in a near frost free climate (USDA zone 9B - 11), sansevierias can be planted outside in a semi-shady area. Otherwise, they make excellent pot plants for indoors or on a patio so long as they receive a moderate amount of light. Propagate your sansevieria by divisions taken from the mother plant. Use a sturdy pot with a layer of pebbles for drainage and topped with a good potting soil. It is also possible to propagate by leaf cuttings. However, this is a slow method and should not be used with the variegated types because the resulting plantlets will revert and lose their markings. Fertilize only once during the growing season in spring or early summer with a water-soluble plant food. Plants will benefit from occasionally having their leaves wiped with a moist cloth to remove dust. This also adds a bit of welcome humidity. Don't water too often, they like to keep their roots on the dry side.